The following text is partilly excerpted from the personal pages of Rik Peirson - son of 1st Lt. John Silas Sheffield Peirson. 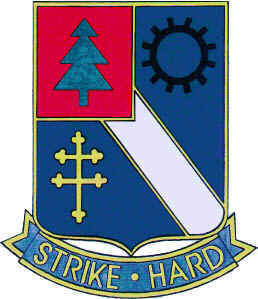 The image on the left is the original 290th Infantry Regiment Crest. It has the image of a kicking mule which is representative of the Regiment's Missouri lineage - the Regiment was formed at Ft. Leonard Wood, Missouri. At some point, it was determined that the original crest did not meet the heraldry standards established by the United States Army. The image on the right (above) is the Crest of the 290th Regiment of the 75th Infantry Division -- Dad's unit in WWII. On Memorial Day, 1999, Rob Smith, a friend, and himself a member of the 75th Infantry Division, 290th Regiment, Anti-Tank Company, sent this Crest to several of us in the "75th Family." Here's the History according to Rob: The Crest was originally designed in the Summer of 1945, while the Regiment was stationed in France after V-E-Day. The Division and Regiment were deactivated, however, before the Crest could be approved and adopted by the Army Bureau of Heraldry. It was reconstructed 50 years later by Raymond C. Smith, Antitank Co.-290th, from the original design. Four insignia represent the four major campaigns of the 75th Division in World War II. In order, they are . . . the Pine Tree, which represents The Ardennes Forest in Belgium; the Cross of Lorraine, which represents the Colmar Pocket in Alsace-Lorraine, France; the White Diagonal, which represents the crossing of the Rhine River; and finally the Toothed Gear, which represents the Industrial Rhur Valley in Germany.